Robert Skikkit is identifed as a soldier in the 2nd NJ stationed at Pompton in late 1780 to January 1781 when his name disappears from the records. 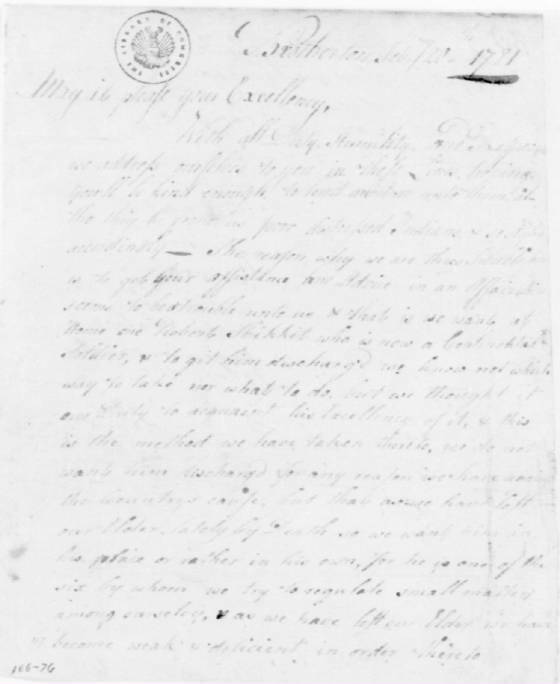 The following letters from his family and tribe at Brotherton relate their attempts to have him excused from military service. His Excellency Wm. Livingston Esq. Those Indians Direct their matters by a council of six; which seems to fall in by Sineority, on account of the Death of one of their old men, Robert Skiket the soldier, comes in for a seat in the counsel, However I submit the whole to your Direction to order as you may think proper. I am your Excy. Most Obedt. Servt. Head Quarters, New Windsor, March 23, 1781. Dear Sir: I was honored, on my return from Rhode Island, with your Excellency's Letter of the 1st. Inst. together with Enclosures. Altho the discharging a single man from the service, is a very inconsiderable diminution of our force. Yet when the innumerable applications on this subject are taken into consideration, the unavoidable decrease of the Army if discharges are granted, the amazing difficulty of procuring men for the War, and the heavy expence attending the recruiting service; it cannot certainly be considered as a hardship, to retain those in service, who were fairly enlisted, and with a large bounty, unless able bodied substitutes are procured in their room. Under this condition, I would consent to the dismission of Robert Skekit, otherwise, it would be opening a door of uneasiness to Others, and doing an essential injury to the Public. 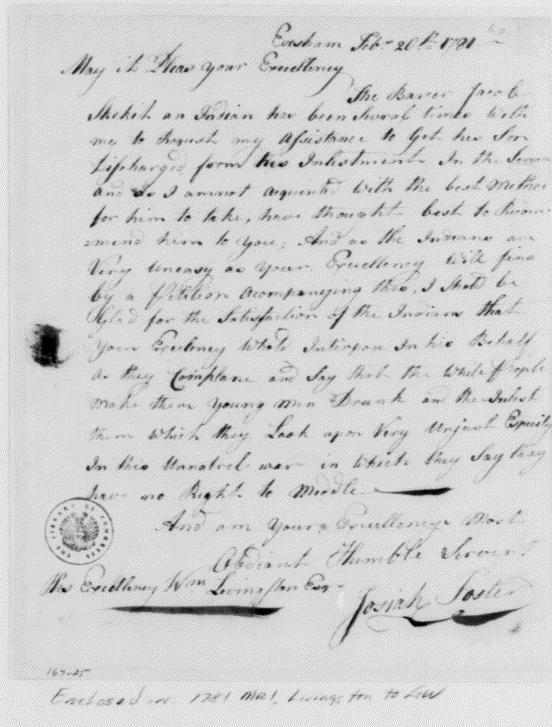 When I was applied to, by you in favour of Robert Skekit an Indian in the Troops of the united States I immediately writ to General Washington on the Subject. The measure I took, more for the sake of convincing the Indians of my readiness to do all in my power to procure the young man's discharge, then from any prospect I had of succeeding n the application, as I know the General's great disinclination to the countenancing that practise. By reason of his going to Rhode Island soon after, I never had an answer from him till yesterday. 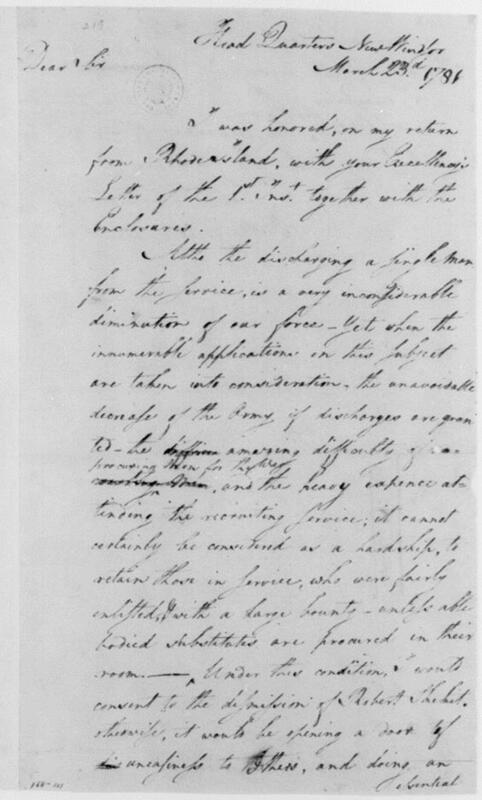 The Substance of that is, "that although the discharging a single man from the Service, is a very inconsiderable diminution of our force, yet when the innumerable applications upon this Subject, are taken into consideration, the unavoidable decrease of our Army, if discharges are granted, the amazing difficulty of procuring men for the war, & the heavy expense attending the recruiting service, it cannot certainly, says he, be considered, as a hardship to retain those in Service who are fairly inlisted, & with a large bounty, unless able bodied Substitutes are procured in their room. Under this condition he will consent to the dismission of Robert Skekit otherwise it would be opening a door of uneasiness to others, & doing an essential injury to the public." When opportunity offers, I hope Sir you will acquaint the Indians with his Excellencys reasons, & I doubt not they will be convinced of their solidity, & if the presence of Skekit is so necessary among his tribe, that they will endeavor to procure his exchange by providing a substitute during the war. David Mitop: Burlington County Militia, late war. Received depreciated pay in 1784. Gabriel Mitop: Enlisted 3/26/1777 by Lt. Curlis of Hagan's Company, 3rd NJ at Bordentown. He appears on the company rolls until his name is omitted by July, 1778. I don't know if this is the same man as in 1758, or his son or nephew. James Mitop: Ross' Company, 3rd NJ. Enlisted 3/14/1777 at Mt. Holly where he lived. He died at Valley Forge on January 28, 1778. 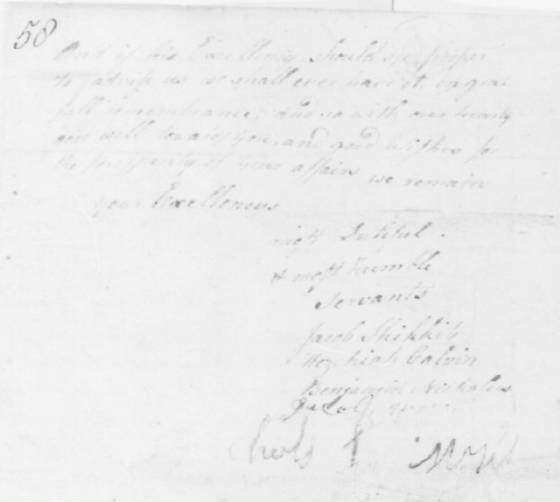 John Mitop: Hagan's Company, 3rd NJ, enlisted 3/26/1777 by Lt. Curlis at Jacobstown, but his name is omitted by September, 1777 fromt the company muster. Thomas Kehela served in the Third Battalion, Gloucester County Militia and also in Col. Somer's Battalion of State Troops. This is likely either the same person on the 1759 map of Brotherton, Thomas Kehala, or his son. Kehela may be a variant of Weequehela. William Cuffey of Monmouth County was described as an Indian. He served in the Monmouth County militia and also in Phillip's Company of the 2nd New Jersey Regiment. He was in the 2nd NJ for 9 months (in 1778, NJ raised men for a limited 9 months service in the Continental Establishment). For most of his time, he was on command at Newark, NJ where he was discharged on February 28, 1778. He was from Stafford, Monmouth County (now Ocean County), described as an Indian, black hair tied, black eyes, well set. He was enlisted in to Col. Samuel Forman's 4th Monmouth Co. militia on May 5, 1778 and moved over to the 2nd NJ Regiment on June 1. Amos Cuffey, also of Stafford, is not identified by any racial catagory, however he is the only other Cuffey in Monmouth County, and must in some way be related to William. He served in Reuben Randolph's Company of the 2nd Monmouth Militia. He served for 55 days at Perth Amboy, where he was discharged on 9/25/1776. There is some information that supports the service of Bartholomew Calvin, son of Stephen and brother of Hezekiah, as having served during the war. There is a military service card for a Bartholomew Calvin in the Pennsylvania State Archives, but there is no additional material in the National Archives. Bartholomew did withdraw from the College of New Jersey (Princeton) due to the cut off of funding by the Society for the Propagation of the Gospel, a Scottish religious organization. The Society also cut off the funding of Daniel Simon, a Narraganset school teacher at Stockbridge. Simon later became the minister at Brotherton and married into the Calvin family. Two Indians belonging to the 2nd Jersey Regiment: William Holmes, 5'8", full faced and pitted with small pox. James Dillap, 5'9", spare built and smooth face. List of recruits for the 2nd Battalion of Cumberland County militia, April 3, 1778 for service in the Jersey Line as 9 month men. William Holmes, born in Pennsylvania, no place of abode listed, age 21, 5'10", Indian, stout made, pock[ed]. Mustered into Continental service, May 25, 1778. Listed as deserted in June, 1778. William Holmes served in the 2nd New Jersey Regiment from 1780-1783 in Capt. Barton's Co. and Capt Jonathan Holmes' Company. Served in the Northern Department. Mustered out May 20, 1783 by Col. Walter Stewart, Inspector of the Northern Army. Received a certificate for pay in the amount of $40.60. In 1796, the state paid William Holmes $21.50 and he received a Land Warrant. His papers are not filed in the National Archives records (indicating that he likely sold or traded his land bounty warrant). Adam Pearce is identified by the DAR as an Indian soldier from Cumberland County. More research is needed on this individual. Another soldier in the 2nd NJ who very well may be Indian was John Hays of Captain John Hollinshead's Company. He enlisted December 15, 1777 and deserted September, 1778. 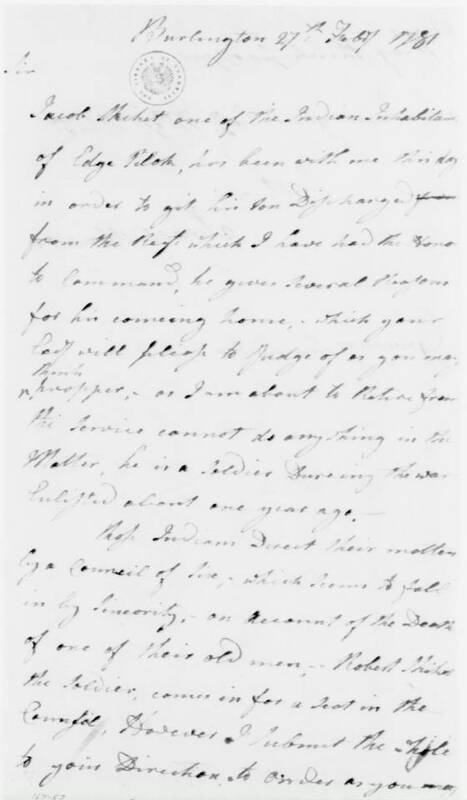 Hollinshead's Company was raised in Burlington County, and this John Hays may be the same person who was Charle's Moolis's brother-in-law as of 1797 and who signed as a Weekping Indian in the 1798 caveat against the Moolis will, and as a Brotherton Indian in an 1817 petition from New Stockbridge about the Weekping land. Foster had related that the Indians complained that their young men were gotten drunk by recruiting officers and enlisted into the army. Another Indian was Cato Grieger. Cato was from an un-named, and now-forgotten Indian village on Oldmans Creek in south Jersey. In March, 1778 he enlisted in a Massachusetts regiment, served at Valley Forge, Monmouth and until the end of the war. After the war, when he was in his mid 30s, Cato married a young woman (age about 15) who was an orphan and had been adopted into the village. She was white. Cato moved to New Stockbridge in the early 1800s, and then took up his land grant in western New York. Most of his grandsons served in the USCT (United States Colored Troops) during the Civil War. Cato was a self-identified Delaware Indian, with a black complexion. A David Muncy served in the Gloucester County Militia, but there were no military service records at the NJ State Archives. Muncy may be an indicator of American Indian ancestry. John Bryant was a veteran of the American Revolution and a self-identified Indian (pension records). He was born in 1763 in Somerset County, New Jersey and enlisted in the army on March 30, 1778, joined on April 22rd and was enrolled in Capt. Polhemus's company of the 1st New Jersey at Valley Forge in May. He served with the unit until the end of the war in 1783. In 1779, the company had a new captain, John Holmes. Bryant was 15 when he joined (based on his age given in later pension documents). After the Battle of Monmouth (the unit was engaged in this fight), he was stationed in Elizabethtown, but by the fall of 1778, he was on command at Rocky Hill, New Jersey (just north of Princeton). 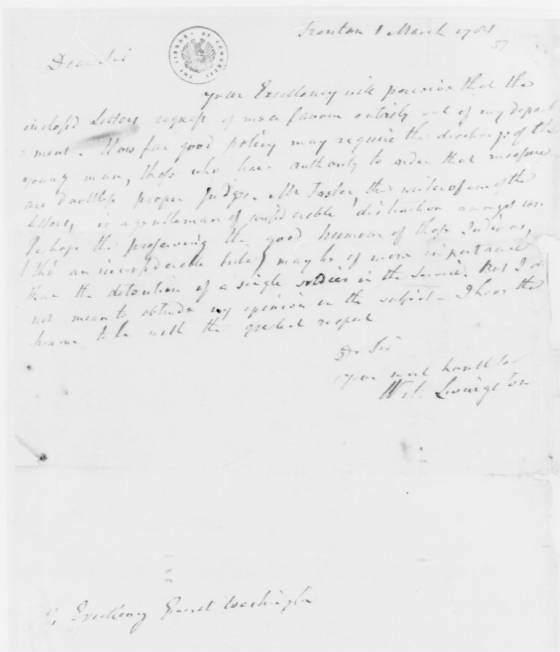 In 1789, he handed over his discharge papers to his former 2nd lieutenant, Peter Lott to apply for his land bounty warrant. Bryant assigned his bounty land to Lott, probably for some hard cash. In 1818, Bryant was residing in Glouscester County, NJ and applied for and received a military pension for $96 per year. By 1820, he was 57, a cripple, and could no longer perform his occupation, basket maker, due to want of materials. His wife was named Martha and she was 25. 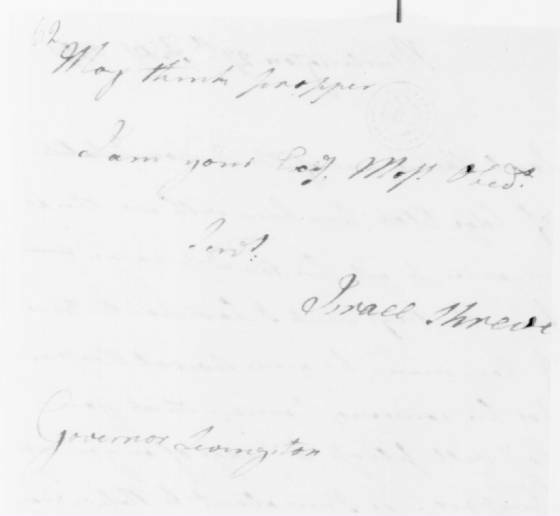 Although John Bryant could sign his name in earlier documents, his handwriting became worse and by 1818 he could only make his mark. Shortly after 1820, he returned to Rocky Hill, where he lived until his death in 1849, at about age 86. In 1854, his then wife, Caroline Bryant (nee Philips) applied for a widow's pension for $96 per year, which she received. John and Caroline were married in East Windsor, NJ (then in Middlesex County, now Mercer County) on Sept. 11, 1831 (he was 68 and she 26). All of this information comes from military service records and pension records. I first became aware of John Bryant from a short passage in a history book on Franklin, NJ which quoted an 1849 newspaper account of John Bryant's death, and also noted that he was a veteran of the Revolution and an Indian. It would be interesting to piece his life and relationships together to see where his family lived, who they were affiliated with, etc. His story also is proof that scattered American Indian families still remained in New Jersey, and who were not living at Brotherton, or the other small clusters in the Jersey Pine Barrens.